South of the Border, Oliver Stone's documentary about Hugo Chávez and other leftist Presidents of North America, opened in New York City this weekend. Here is Richard Corliss's report of its world premiere last September at the Venice Film Festival. The rumor spread around the Lido like a Venezuelan oil fire: that the Venice Film Festival had paid for Oliver Stone's trip to show his new documentary South of the Border but wouldn't cover the expenses of the film's chief subject, Hugo Chávez. To some on the European (and American) Left, the President of Venezuela is a hero for his redistribution of wealth and truculent stance toward the U.S. under George W. Bush, whom he famously called the Devil. To others, his socialist agenda is tainted by human-rights violations and suppression of the opposition press. So if Chávez wanted to see the film at its world premiere, he'd have to fly here on his own bolívar. The Sept. 8 evening public screening in the festival's Sala Grande  for which there was less visible security than for an inner-city high school  began about 25 minutes late. The delay simply amped up the suspense: Would Chávez show? He did, with Stone, both wearing dark jackets, white shirts and red ties. As is customary for the evening screenings, the festival's female announcer slowly read off the names of a half-dozen members of the movie's production team, standing in front of their seats in the front mezzanine. Polite applause for each. She got to Stone: hearty cheers for the writer-director of Platoon, Born on the Fourth of July and JFK. Then the announcer stopped. Chávez would not be officially introduced to the audience. So the director grabbed the President's hand and raised it above their heads in a victory grip. No boos or rude cries greeted the gesture. Only: Ovation! Olé! The 70-minute movie  which was co-written by the British-Pakistani commentator Tariq Ali, author of the 2006 study Pirates of the Caribbean: Axis of Hope, and photographed in part by docu-doyen Albert Maysles  is amateur night as cinema, as lopsided and cheerleadery as its worldview. U.S. foreign policy, Stone asserts, divides South American nations into "friends, whose leaders do what we tell them to do, and enemies, whose leaders occasionally disagree with us." His film is no more nuanced. He sees the geopolitical glass as all empty (the U.S. and its world-banking arm, the International Monetary Fund) or all full (Chávez and his comrade Presidentes in South America). But there's an undeniable fascination in the project, even some inspirational value, in Stone's conversations with a half-dozen leaders of nations struggling to emerge from under the shadow or boot of the U.S.
Stone extends his rigorous dichotomy to the film's structure. The first half focuses on Chávez, the second on other South American heads of state who tilt to the port side: Brazil's Luiz Inácio Lula da Silva, Paraguay's Fernando Lugo, Ecuador's Rafael Correa, Argentina's Cristina Fernández de Kirchner, Bolivia's Evo Morales and the grand old man of social revolution, Raúl Castro. (Stone profiled Raúl's brother in a similarly indulgent 2003 poli-doc, Commandante.) The only missing socialist leader is Daniel Ortega, President of Nicaragua  a regime whose electoral council outlawed the two main opposition groups from participating in the 2008 election and barred outside observers from monitoring the vote, which was widely criticized as rigged. The film's first section briefly synopsizes Chávez's life from his mud-hut birth in Sabaneta to his rise through the Venezuelan military, to his abortive coup attempt in 1992 and his election seven years later to lead the world's third-largest oil provider  increasing the standard of living for many of his country's poor while denying many rights to those, especially in the media, who would oppose him. In the movie's rose-colored lens, the President comes across as an outsize personality, equal parts machismo and charisma. He sounds more sensible than menacing when he says of his government, "This is a revolution, peaceful but armed." Standing near a corn-processing factory, he jokes, "This is where we build the Iranian atomic bomb. A corn bomb." Every step of the way, Stone is by, and on, on the President's side. He raises no tough issues, some of which are summarized in Amnesty International's 2009 report on Venezuela: "Attacks on journalists were widespread. Human-rights defenders continued to suffer harassment. Prison conditions provoked hunger strikes in facilities across the country." Referring to the 2006 election in which Chávez won a third term, Stone tells viewers that "90% of the media was opposed to him," and yet he prevailed. "There is a lesson to be learned," Stone says. Yes: support the man in power, or your newspaper, radio station or TV network may be in jeopardy. The movie's second half has more appeal to a general audience, perhaps because most of the other Presidents are less famous or notorious than Chávez, perhaps because the first half has conditioned us to a rigorously genial treatment of them. Lula da Silva brags that Brazil paid off the IMF debt and that the country now has a $260 billion surplus. (Irmao, can you spare us a dime?) Morales, the first indigenous President of Bolivia, says he considers himself "less a President than a union leader." The Illinois-educated Correa says smilingly that the U.S. can again have a military base in Ecuador "if Ecuador can have a military base in Miami." Raúl Castro, survivor of a half-century of American disapproval, toasts his younger compadres: "Now we're ready for another 50 years." As big an international celebrity as any of his subjects, Stone is ever willing to interrupt an interview for some schmoozing or fun. He kicks a football around with Chávez, shares coca leaves with Morales, quizzes Kirchner on how many pairs of shoes she owns. (A little annoyed at the implicit comparison to Imelda Marcos, Kirchner replies, "If I were a man, would you ask me how many pairs of pants I own?") Accompanying Chávez to the mud hut where he was born, Stone directs the President in a scene: ride around the yard on the bicycle you had as a kid. Chávez mounts the tiny bike and takes a few pedals. Instantly it breaks from his weight, and Chávez dissolves in laughter. South of the Border is a near sibling to the Michael Moore docu-comedy Capitalism: A Love Story, which premiered at Venice last night and which looks like a masterpiece of attitudinal moviemaking next to Stone's slapdash effort. Moore appears in a news clip from 2007, lecturing Wolf Blitzer on what the filmmaker saw as CNN's gutless coverage of the U.S. Iraq invasion. Moore and Stone share the notions that capitalism can be predatory and that priests, in the U.S. and Paraguay (where the President is a former Catholic bishop), are all liberation theologians. And in both films, Barack Obama's election is heralded as triggering an era of enlightenment. "I hope he will be a new Roosevelt," Chávez says at the end of the film, "and I hope he starts a new New Deal." As the final credits rolled and the house lights came up, the director and his star received the crowd's vocal warmth. Chávez went to the bleachers to greet a few people, then descended the steps to the orchestra area. Someone asked him a question, and he spoke for five minutes or more in Spanish, in a conversational voice that not many could hear. Stone, slightly behind, seemed to wonder, Hey, whose movie is this? 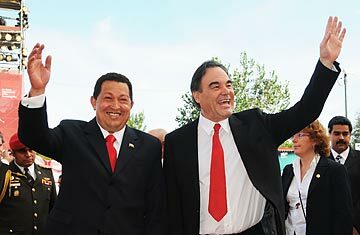 and joined Chávez as he shouted, "Viva Oliver!" He made it sound almost like "Bolívar!" A small retinue of guards led them down the steps to the lobby, and on the way out, Chávez smiled and shook a few more hands. Quite a powerful grip, Mary Corliss told me. But then, he is Venezuela's strongman.